17 year-old Ree Dolly (Jennifer Lawrence) embarks on a mission to find her father after he uses their family house as a way of securing his bail and disappears without a trace. Faced with the possibility of losing her home and being turned out into the Ozark woods, Ree challenges her outlaw kin s code of silence and risks her life to save her family. She hacks through the lies, evasions and threats offered by her relatives and begins to piece together the truth. 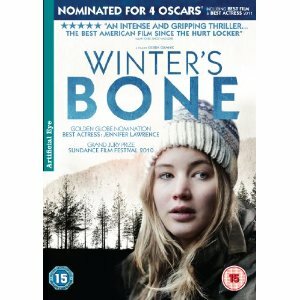 Winner of the 2010 Sundance Film Festival’s Grand Jury Prize and Waldo Salt Screenwriting Award, WINTER’S BONE is directed by Debra Granik (DOWN TO THE BONE) and adapted for the screen by Granik and Anne Rosellini. Based on the best-selling novel by Daniel Woodrel. Click here to see original article. This is a story about a girl trying to cope with her father’s disappearance and look after her sick mother and her brother and sister set against the bleak backdrop of Missouri and the increase use of crystal meth in community. Trying to find her father in a bid to rescue her family from been kicked out of the house by a bondsman. I thought this film deserved it’s Oscar nominations and it’s Sundance film awards. The bleakness of this part of Missouri really comes out because of the colouring of the countryside through the lenses of the Director “Debra Granik”. You also get a real sense of cold and being uncomfortable. There are also great performance by Jennifer Lawrence and John Hawkes. A lot of the actors here are locals and never acted before. I do not think this film will win the Best Picture Oscar but it was a great film all the same. This entry was posted in Movie Of The Week and tagged Academy Awards, Movies. Bookmark the permalink.